I thought I’d spend the next couple of days showing you some of the fun projects we did in her room. 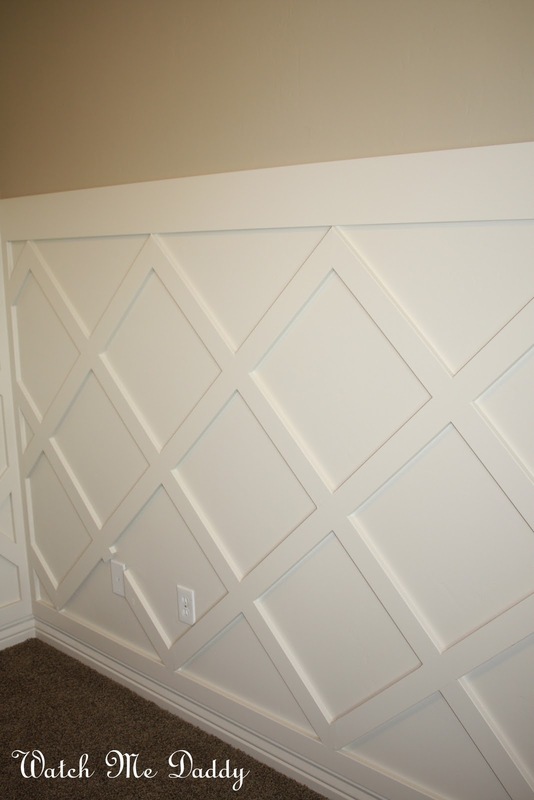 I loved the result of our board and batten in the living room so much that I decided I wanted to do some sort of wainscoting in the baby’s room too. Only, I didn’t want to do the exact same thing. That would have been much too simple. Nothing can ever just be simple. I wanted to do something I hadn’t seen before. That’s not to say it’s never been done, but just that I hadn’t seen before. I pre-painted all the mdf and walls. Only I was a few boards short, and more than a little short of patience, so for the last few cuts I just stuck the primed board in there. So here it is all up with wood filler on. I did a lot of the manual labor in this room while my husband was at work because I felt self-imposed pressure to get it done by a certain date. Not totally sure why I did that, but I’m glad now that I did because this was a tricky little project. You know, the kind you shut the door on and forget about for a few days at a time to keep your sanity. I’m already a little crazy though, so I figured may as well forge my way through the crazy and get it done. Although, I did leave the sanding entirely to my husband. He sure loves his baby girl too! Who else would spend so much time sanding down the walls of a room just a few hours after a bottle of peaches exploded in his face, a trip to the ER, and six stitches above his eye! Scary. Such a good daddy. For this wall, I decided not to add a ledge to the top. I think I’ve mentioned before just how small the bedrooms are in our house, and I didn’t feel like I could give up even an inch more for the ledge. Instead, I decided on just a clean and simple 1×6 for the top trim. I love how it turned out. Feels so calm and comforting in her room, which is the feeling that I was going for. I had originally planned to paint the top part of the room in a super pale blush pink, but somewhere along the journey decided that I wanted to keep it tan and just accent the room in pink. I’m not going for pink overload here, just simple calm elegant. I guess I’m trying to get a lot of feelings out of such a little space. It seems to be working though. I just love this project. Still trying to find a room in the house that I could do this and get my husband on board with doing, I love it! Thanks for sharing this inspiring idea for transforming an office or spare bedroom into a nursery. This is such a creative remodeling project that will add a unique touch to any room in the house! oh that is really nice! I love this! I have been looking for pictures of trellis walls, and finally came across this post. Did you follow any specific instructions, or is your husband just awesome and he figured it out on his own. Either way, it looks adorable. Hi! I’ve been looking FOREVER about this accent wall and how to do it! COULD YOU PLEASE TELL ME where you purchased the product and it’s exact name??? I’ll be on my way to my bedroom wall in my new house!